In the 18th century it was customary for pilots to be taken to out to ships by boat from Deal or Dover. After 1812, two large pilot cutters either anchored or cruised off Dungeness, waiting for ships coming up channel. The Argus cutter was purchased in 1824 by two Deal pilots, Thomas Thompson and Robert Sherwood, and sold 5 years later to George Clendon senior, a warden of the Deal pilots, ‘in trust for all and every the pilots for the time being…’ The master in 1829 was William Gosley, also a pilot. A crew of 7 worked the vessel and the ships boats, and up to 20 pilots were carried aboard at a time. The Registry of British Shipping for Deal shows that this ship was built in Hastings in 1812. She was 76 tons burthen, 58 ft in length an 18 ft in the beam. 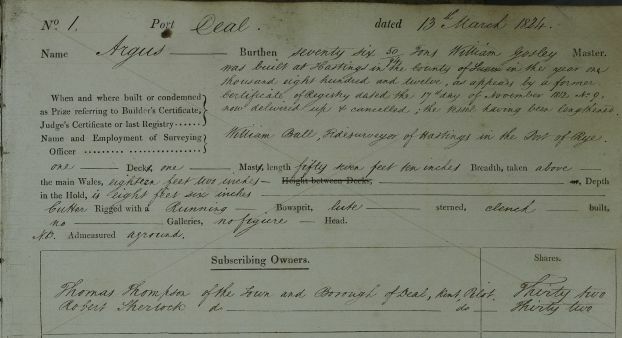 The image shows part of the registry entry for 1824. 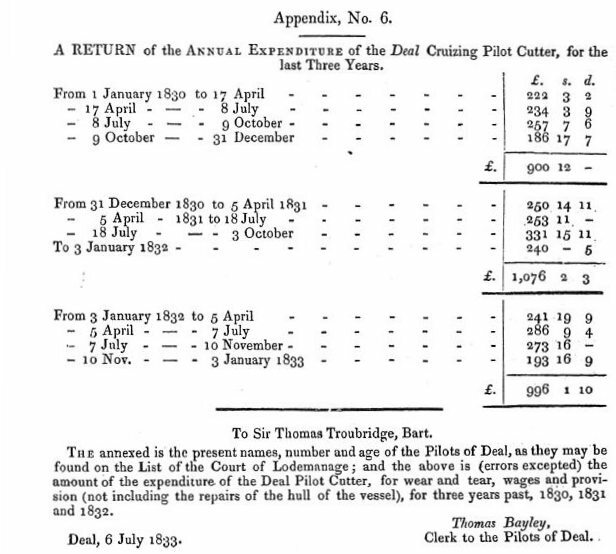 The annual upkeep of the Deal cutter was about £1,000 in the 1830s according to a House of Commons Report published in 1834. The funds came out of the self-employed pilots' earnings. The table shows the details of expenditure over three years. The Argus remained in use at Deal until 1843 when the master was Richard Mowle. She was sold on to Dover owners, and shortly thereafter to Faversham.